I love green salads and will typically take one for lunch every day, but they do get old after a while. Especially during a Whole30, when variety can be the difference between completing 30 days with minimal stress or falling face first into a box of doughnuts. 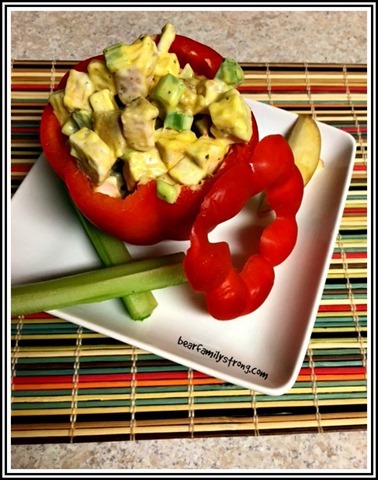 Another one of my lunch staples is chicken, egg, or turkey salad made with homemade mayonnaise, and instead of the same old bed of greens, one day I decided to change it up by using a fresh bell pepper as a “bowl” – and this lovely little lunch was born! Basically, dump everything into a bowl and mix well. Taste and adjust seasonings as necessary. Cut off the top of your bell pepper and scoop out the ribs and seeds, making a nice “bowl”. Hint: when picking out a bell pepper, find one with a relatively flat bottom that will stand on it’s own as your “bowl”. 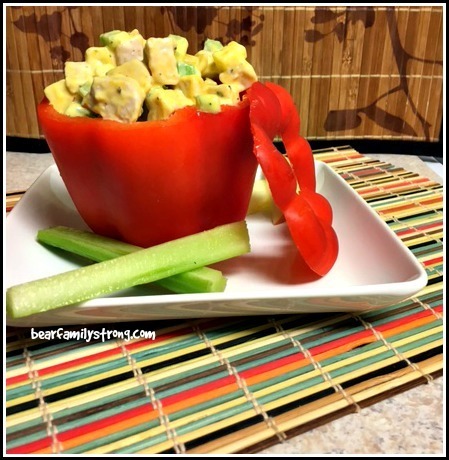 Fill your pepper bowl with salad and voila! Although it’s nice to use a bell pepper to stand up, it’s not strictly necessary and to be honest, it was more for presentation than anything else. You can always just slice up your bell pepper into thick strips and “scoop” your salad into them. While I did throw the entire turkey filled pepper into a tupperware and took it to work a is, I ended up cutting the pepper into scoops and eating it that way. If you’re taking this to work for lunch, as I did, I’d also recommend bringing some additional snacks as a supplement. I packed baby carrots and some macadamia nuts for the extra veggies and protein. 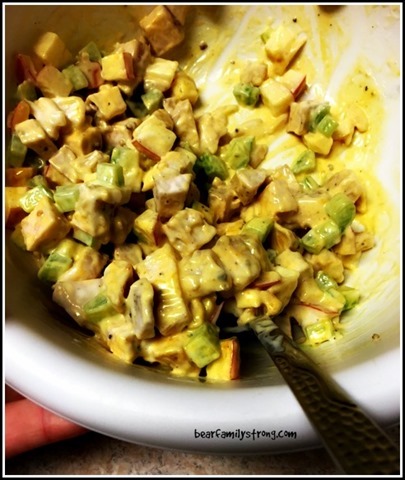 In any case, this was a delicious change to my tried and true “grilled chicken breast over mixed salad” lunches. Plus, it just looks so pretty! 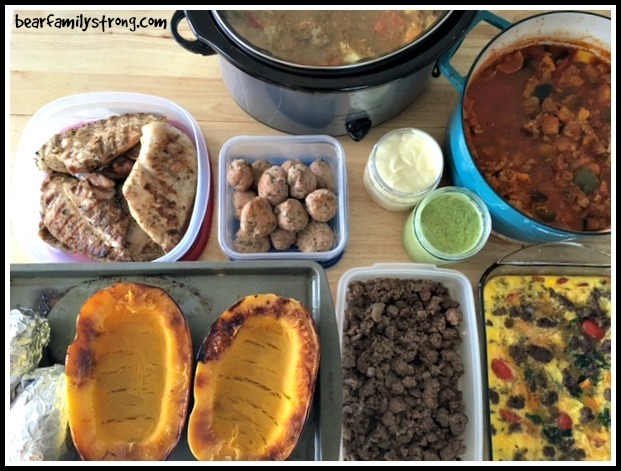 I could have (and almost did) called this post “Meal Prep Saturday” – kind of like my Sunday Food Prep posts, but on Saturday. But I was looking for something that sounded a little more interesting, and then when I decided to essentially walk you through what my weekly cook-up looks like, the post sort of named itself. 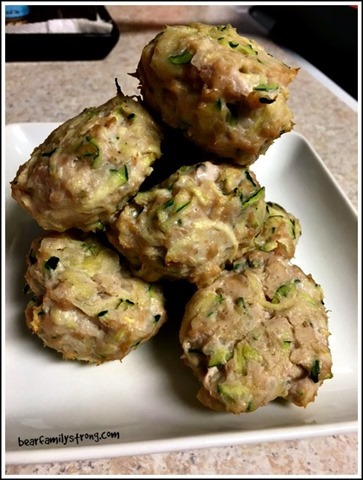 This particular “edition” of my weekly food prep session is piggybacking off of my favorite paleo/whole30 blogger, Melissa Joulwan. 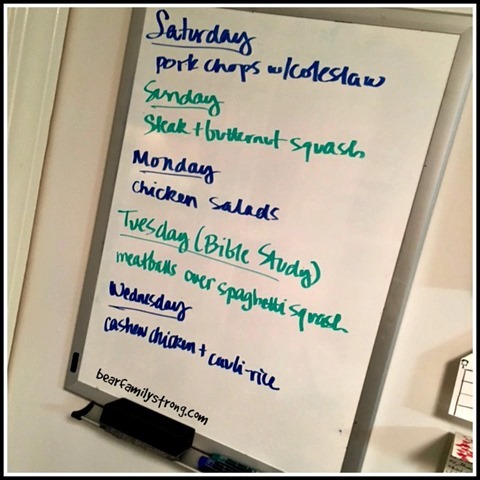 She has a great series of posts on “Meal Planning” – and I only use that term loosely because she does, as well. It’s more a series of “Cook-ups”, where she walks you through the steps of a weekly cooking marathon that will leave you with a weeks worth of delicous, Whole30 approved food. It’s like my Sunday Food Prep sessions on steroids. 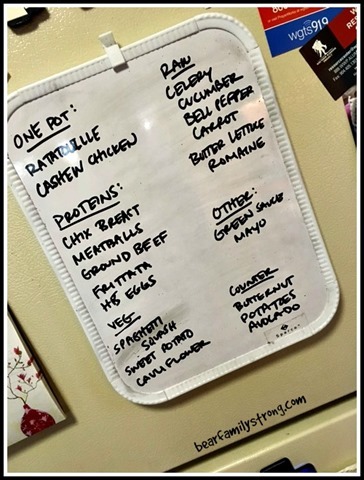 Because our lunches typically consist of salads with protein, or protein and raw vegetables and maybe half a baked sweet potato, or leftovers from the previous night’s meal if it was large enough, there’s no need to add them to the white board. (Plus, I always run out of space!) This week, however, we’re working through some odd scheduling issues and so I wanted to make sure we had enough pre-cooked food on hand for the entire week. To make food prep easier, Mel recommends making something in a slow-cooker, and some kind of stew or chili each week, in addition to basic proteins and a variety of vegetables and sauces. You’ll notice I’m not making many vegetables – starches aside, I typically prefer to cook them right before I eat them; or I eat them raw in the form of sliced veggies or salads. 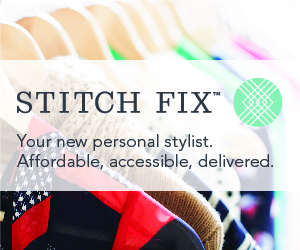 So without further ado, here’s what we’re making this week! The keys to successfully executing a weekly cook-up are time management and planning. One method is doing a continuous afternoon of work and knocking everything out at the same time. My personal preference, however, is to plan my cook-up around the rest of my day. Let me explain. 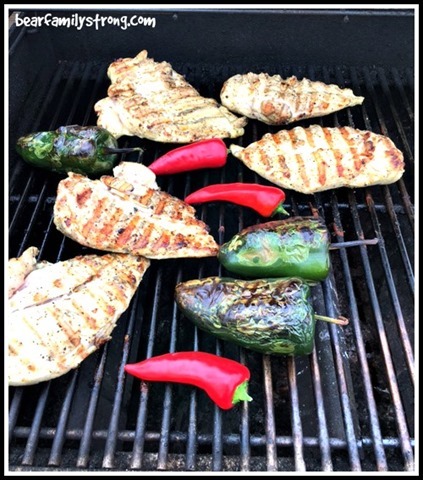 While none of the things I intend to make are particularly hard, some of them – like brined and grilled chicken breasts – require a few extra steps. So when I found myself with some extra time to kill before my Crossfit class because I woke up earlier than normal to see my Husband off to work, I hard boiled a bunch of eggs and got my chicken breasts brining so I could grill them later in the day. Getting these two items out of the way before my workout took less than thirty minutes and saves me that step later in the afternoon. Also thinking ahead, I set aside an egg and a lemon to make homemade mayonnaise later (it works best when they are at room temperature). Then I ate a banana and almond butter, finished off my last cup of coffee, and headed off to Crossfit! Later on after a great workout, a post-workout meal, and a shower, I got down to the real work. This is where a little bit of planning comes in handy. The goal is to organize your cook-up into something that makes sense – get your prep work out of the way, then work smarter, not harder. If you’re making a crockpot meal or something that requires slow simmering on the oven, get those meals ready first so that you can leave them to cook on their own while you take care of something else, like grilling chicken breast or baking meatballs. Ready? Grab something to drink, put on some fun music, and let’s get started! 1. 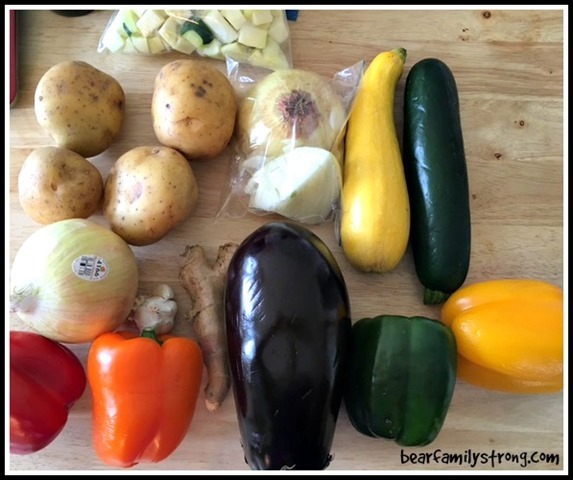 Chop and peel all your vegetables – for me this included onion, eggplant, zucchini, yellow squash, bell peppers, and potatoes; as well as fresh ginger and garlic. I separated the vegetables into bowls based on what recipe it was for and when I needed it. I also prepped my spaghetti squash by cutting it in half and scooping out the insides, as well as wrapping two sweet potatoes in foil. Had my crockpot meal not required the oven (I needed to roast the cashews), I would have thrown the squash and potatoes in the oven to roast at this point. 2. 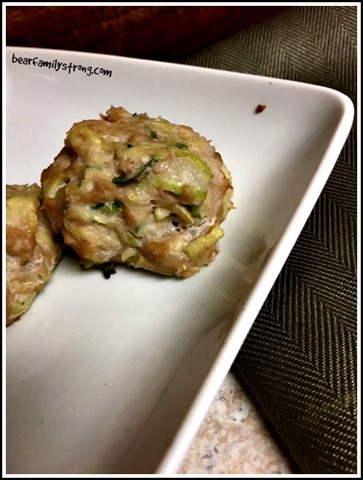 Start on your slow simmer meal – I began to cook the vegetables and brown 1.5 pounds of turkey for the ratatouille, and while that was going I prepped the ingredients for my crockpot meal. 3. Once my ratatouille was simmering, I turned my full attention to the crockpot meal. And just a note: although the cashew chicken ended up tasting pretty good in the end, it was definitely a lot more involved than your standard crockpot meal (see step 1 re: cashews above), so I spent more time on this step than normal. 4. Once the cashews were roasted and added to my cashew chicken, I coated my spaghetti squash with oil and laid both halves face down on a baking sheet alongside my foil wrapped sweet potatoes, tossed them in a 375 degree oven, and set my phone timer for 45 minutes. 5. Next step – into a bowl I tossed the other 1.5 pounds of turkey (it was a 3 pound family pack from Wegmans) with fresh diced parsely and some italian spices and made up a bunch of turkey meatballs. 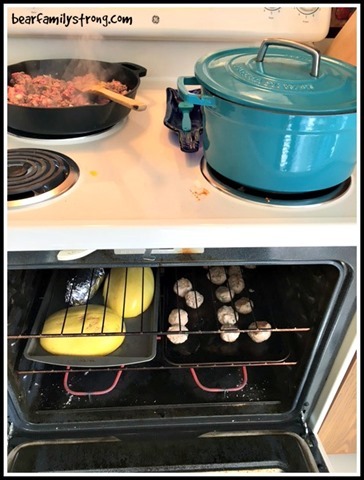 They immediately went into the oven with the squash and potatoes, and I set the oven timer for 15 minutes, flipping the meatballs halfway through. 6. Vegetable chopping take two – I completely forgot to set aside diced onion for my ground beef, as well as bell pepper and cherry tomatoes for the frittata. 7. 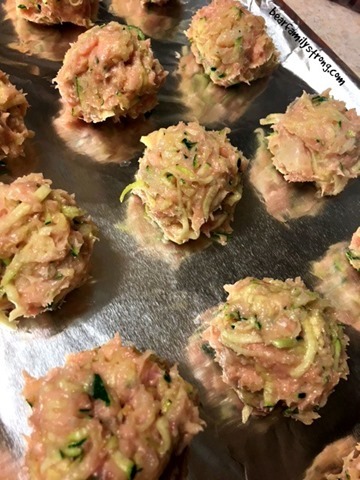 Once I removed the meatballs from the oven and set them aside to cool, I heated up my cast iron skillet and set to work browning two pounds of ground beef with diced onion, fresh parsely, salt, pepper, and garlic powder. 8. While your beef is browning, go ahead and check your spaghetti squash and potatoes. I took the squash out of the oven at about 45 minutes and left the potatoes in about 20 minutes longer. 9. After the beef was done, I used the same pan to saute some onion, bell pepper, cherry tomato halves, and fresh spinach. Then I tossed that into a glass baking dish, added about a third of my ground beef, and topped it off with ten beaten eggs. Into my already heated 350 degree oven for thirty minutes! 10. This was a good time to check my ratatouille and give it a good stir. In fact, after almost three hours of work it was also a good time for me to stop and eat a small bowl of ratatouille as a snack/small meal. 11. In between bites, I heated up the grill (it was perfect grilling weather!) and rinsed my brined chicken breasts. After coating them with a healthy dose of olive oil and Trader Joe’s 21 seasoning salute I added them to the grill, as well as the poblano peppers and red fresno chiles I needed for my spicy green aioli. …I had every intention of cooking up a batch of oven roasted cauliflower rice, but I could not bring myself to clean the food processor one more time. Instead I cleaned my kitchen, which took just as long. Whew! Now, take some time to pull out all the tupperware containers you own, because you’ll need them! I actually don’t have enough large tupperware containers, and so the ratatouille and the cashew chicken just ended up going straight into the refrigerator in their pots. Once we eat enough servings to get them down to a more manageable amount I’ll move them to smaller containers.